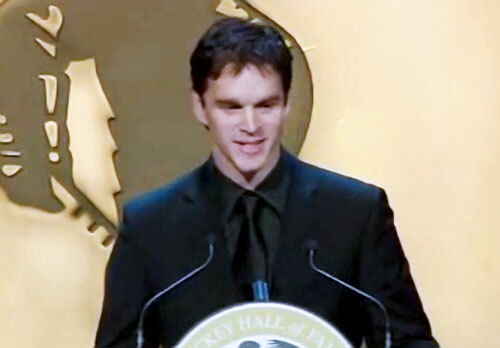 Luc Robitaille is the current President of the Los Angeles Kings as well as a former NHL left wing who played for 4 teams in a career spanning 21 years from 1986-2006. Robitaille played for the Los Angeles Kings from 1986-1994, the Pittsburgh Penguins in the 1994-1995 season, the New York Rangers from 1995-1996, the Los Angeles Kings again from 1997-2001, the Detroit Red Wings from 2001-2002 and once again for the Los Angeles Kings from 2003-2006. Robitaille is a three-time Stanley Cup winner as well as an eight-time All-Star. In 2017 Robitaille was named by the NHL as one of the ‘100 Greatest NHL Players’ in history. Luc Robitaille’s #20 jersey was retired by the Los Angeles Kings in 2007. He was inducted into the Hockey Hall of Fame in 2009. PFP Sports Talent Agency is a top booking agent for motivational sports speakers and sports personalities. If you would like to book NHL stars like Luc Robitaille for a speaking engagement, personal appearance or special event, you can request Luc Robitaille agent and speaker information from PFP Sports Talent Agency or call 800.966.1380.